Another Word on the Street has wrapped up, and like last year, and every other year I've attended the festival, it was a wonderful day. I love seeing so many people buying, reading, signing, and celebrating books and magazines. Hamilton's Miranda Hill reads from her collection of short stories, Sleeping Funny. Stuart McLean at the PEN Canada booth. At his launch last week, Mark Leslie called his new book, Haunted Hamilton, a “love letter to Hamilton.” A transplant to the city, Leslie, like many of us, has grown to love the sights, sounds, people, and places this city has to offer. I couldn’t help but swell with pride over all of these things as thousands of us took to the streets for Supercrawl 2012, prompting this, my own sort of love letter to the city. I grew up in Burlington, and fact is, a lot of Burlingtonians simply don’t get Hamilton. Even though my dad was born and bred in Hamilton, each car trip into the city inevitably included the following statement when Plains Road became York Boulevard: “Lock the doors! We’re in Hamilton!” To me, Hamilton was gritty. It was unpolished. However, two decades would pass before I realized these are exactly the qualities I love about this city. I did find a city I loved as much as I loved Ottawa. In fact, I found one I loved even more. And to my surprise, it was Hamilton in all its gritty glory. The slogan “You Can Do Anything in Hamilton” has been getting a lot of attention in the past few months, and it really feels like an accurate statement to me. Meeting people has never been easy for this shy, socially awkward gal, but there’s something accessible about this city. There’s something that makes us all want to meet new people, get involved, and be a part of what is happening in this city. A day doesn’t pass living in Hamilton where the opportunity doesn’t arise to meet new people with the same passions and values and love for this city, whether it’s while bent over a laptop at Mulberry or taking a sewing class at Needleworks. And these experiences multiply further and further when you consider social media. Who would have thought simply starting a blog and becoming active on Twitter would eventually lead to real-life friendships, LitLunches, and trips to book readings like tonight’s Terry Fallis launch of Up and Down? All of these things, and many others, floated around in my mind while wandering around the James Street North neighbourhood on Friday and Saturday of last weekend, listening to Terra Lightfoot, Born Ruffians, Great Lake Swimmers, and Owen Pallett, to name only a few. I bought books at the gritLIT booth before climbing the stairs to the Jackson Square rooftop to watch short films and eat free popcorn. And while watching trapeze artists take to the sky, I couldn’t help but think about how much Supercrawl has already evolved in its short, three-year life span. I’m not a musician. The thought of making any kind of visual art makes me shudder. I didn’t even get around to sewing together hexagons for the Beehive Craft Collective’s installation. Yet, I think like so many people at Supercrawl, I didn’t feel like only a spectator. I felt part of something. Something that’s evolving and vibrant and refreshing. 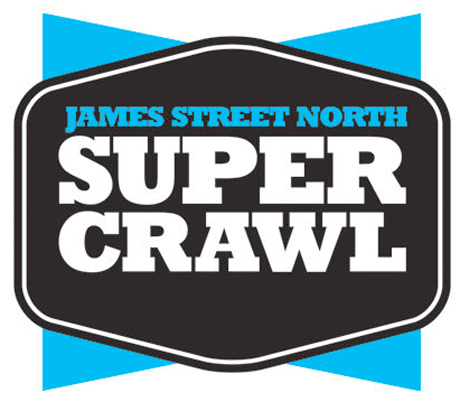 I can’t wait to see what Supercrawl 2013 brings. I have time for a really quick post before heading out to Supercrawl Day #2. Last night, still sporting my work clothes, my first Supecrawl stop was the Hamilton Public Library for the launch of Mark Leslie's newest, and first non-fiction, book, Haunted Hamilton. I must admit, the paranormal isn't a subject I'm very familiar with, or even very interested in, but I am a huge history nerd, and I love reading and listening to stories, especially mysterious ones, about Hamilton's past. The launch even included a ghost walk, hosted by Haunted Hamilton, through the city's core. Dad poses with one of Mark Leslie's stage assistants. After checking out Wax Mannequin at the Colborne Stage, it was off to meet up with The Rest who were very grumpily waiting for some Indian food before their set at This Ain't Hollywood. It's impossible to walk down James Street without seeing a new store, coffeeshop, or gallery pop up. One of the latest additions to the neighbourhood is Cafe Oranje, whose new home is the beautifully restored Lister Block. For a city that was so short on coffee culture when I moved here almost five years ago, Hamilton now has dozens of choices especially with new additions like Cafe Oranje, Radius, and Red Crow, all on James Street. Finally, it was off to This Ain't Hollywood for a few too many pints and a great show by The Rest. I was even able to briefly connect with Kristen from one of my favourite local blogs, I Heart Hamilton.